A chandelier has been chosen! If you are unfamiliar with the chandelier story, four posts will describe the search (so far) and you can catch up by reading HERE, HERE, HERE and HERE. The chandelier is being wired, and will arrive in June which should give me ample time to prepare my husband for this little surprise. Serious blankness, right? This space is just begging for a beautiful chandelier! Now, just imagine the space filled with this! I was a little nervous about adding another chandelier in such close proximity to the chandeliers in the entry and the dining room... but I think this one works because the shape, color and texture don't compete with the other two. Each chandelier is so different, yet they have a similar feel and will blend nicely. The chandelier will be hung from the center wood beam. (There are three sets of beams all together.) This will put the chandelier just over the coffee table, in the center of the room. With cathedral ceilings, even with the beams, there is a lot of open empty space. The addition of the chandelier will fill some of that empty space and give this room a warmer, cozier feeling. The chandelier will provide additional lighting to the room. The few lamps I have in the living room don't provide much light, and I didn't want to cover the cathedral ceiling with ugly cans! There are only four small cans in the little alcoves with windows. This room gets a bit dark on gloomy days and this new lighting source will be a welcome addition. Getting electricity to this center beam will be tricky, and I will post the process... it should make for an interesting activity. I have a plan and it must work! 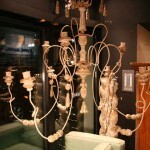 The chandelier comes from Antiquaire located in Highland Park, IL. Melissa Edelman offers exquisite European antiques primarily from France (my fav) as well as Italy, Spain, Sweden and England. In addition, Antiquaire is featured on 1st Dibs, and has a wonderful online shop as well... thank goodness! Melissa has been extremely helpful and I am so happy I found her! What a gorgeous choice. It is a beautiful chandelier, that will look great in that space. Your new/old chandelier is wonderful! Getting electricity down shouldn’t be a problem on the beam since I had to do the same thing, just run the wiring along the beam and then drill a hole for the wire to go through…voile! I can’t wait to see it hung! Love it! Love the room! And can only imagine how exquisite the two will look together...think you made an amazing chioce...really beautiful. You have superb taste..cannot wait to see it all hung up! Love the room just as it is....so it will just move to a new level of fabulousness once your new chandelier is hung!!!! I feel as though Ianded in the south of France here. The chandie will look stunning. Cannot wait to see it there all lit up! Beautiful interior! I am so excited about your blog. Thanks for letting me know! Eddie! OMG, I'm so excited you visited my blog! I wish I could come to Ivy Market! I'd love to meet you in person... one of these days! I am in love with your new chandelier!!!! It's going to look perfect in your space. Can't wait to see it! You have good points there, so I always love your site, it looks like you are an expert in this field. keep up the good work, My friend recommends your blog.